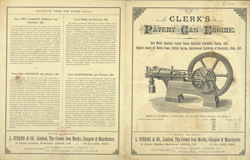 This leaflet is advertising Clerk's patent gas engine. Dugald Clerk, an engineer from Glasgow in Scotland, devoted himself to researching the theory and design of gas engines. In 1881 he patented a gas engine that worked on the 2 stroke principle, this became known as the Clerk cycle and was used in large gas engines and small petrol engines. By 1886 Clerk was established in Bormingham conducting gas research for the Tangye Company, and he later partnered G. C. Marks in a successful consulting and patent agency business. Clerk was knighted in 1917 although this was in recognition of his war time work for the Trench Warfare Committee, rather than his research into gas engines.